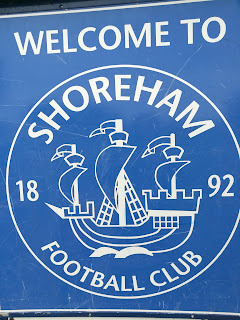 It’s off to West Sussex for the second consecutive week, as my inaugural groundhopping season takes me west along the coast to Shoreham’s Middle Road Ground. (Or the Taxi-link Community Sports Ground, as it seems to be listed in the program). Damn this commercial era! Having visited a side that won promotion from this level last time out (Haywards Heath), this week I’m visiting a team that was relegated back into it. Arriving at the ground at just after 2:40, I’m not at all surprised to find the small car park located outside it is already full. It’s no issue, though. There’s plenty of space on the surrounding roads. Admission, as seems to be the standard in the SCFL Division (or at least at the three games I’ve attended so far) is £6 for adults. Once again, I’m heartened to discover that there is no charge for my two kids. I mentioned it in my blog last week, but I strongly believe trying to encourage children (or families) to watch games at this level is massively important, and ‘Kids Go Free’ schemes are a great way to do this. Also, I want to give another special mention to the matchday program, which at £1 was well worth the money. I’m old fashioned, I know, but I do like a matchday program and really hope clubs keep producing them – although I fully understand their reluctance to do so if they are not in any way financially viable. Thankfully, after having attended the last three games with me, my children are finally getting used to the lack of scoreboards at this level. (Confused? Click here to find out why this is apparently an issue to young minds). Unfortunately, my youngest now seems to have switched his concerns to the lack of a tunnel. Me: “Then they’ll get wet. They’d get wet when their playing anyway, wouldn’t they? Quite why this is an issue, I couldn’t possibly say. I didn’t dare ask. Still, I’m sure we’ll get there. Eventually. Middle Road consists of one main covered stand which runs part of the way down the near-side touchline, while there are a couple of smaller covered areas behind the goal. The clubhouse is a decent size, with a good selection of drinks and snacks (both hot and cold) available, while a sizable TV set keeps you up to date with scores from professional games around the country courtesy of Soccer Saturday. So, to the game itself. As the title of this post suggests (that’s right, thankfully it refers to the match, we didn’t witness an actual crime) Eastboune Town will be feeling extremely hard done by, by the result. They looked sharper from the outset, and constantly looked to attack down the flanks where the impressive Brad Pritchard and George Taggart were causing all sorts of problems for the Shoreham defence. 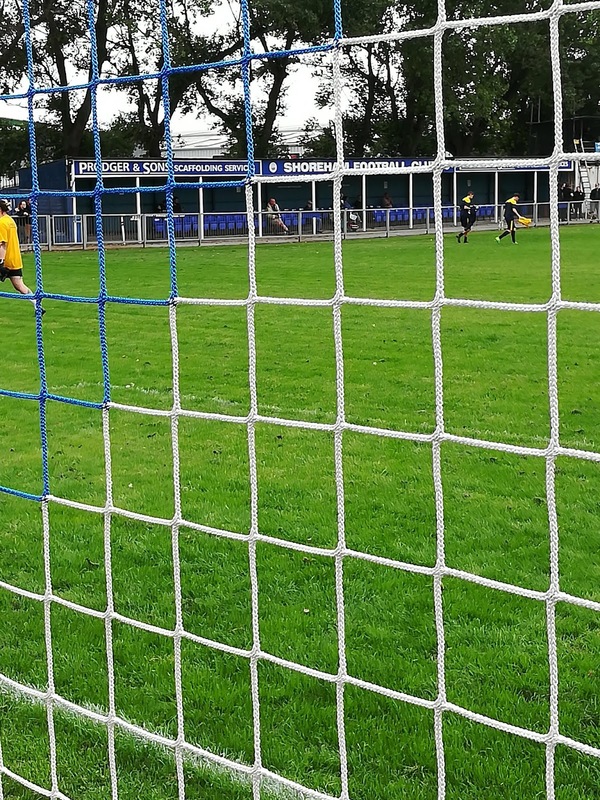 There were plenty of chances for the visitors during the opening 45 minutes – mostly coming from crosses – but a mixture of slipshod finishing, determined defending and poor final balls kept the Shoreham goal intact. 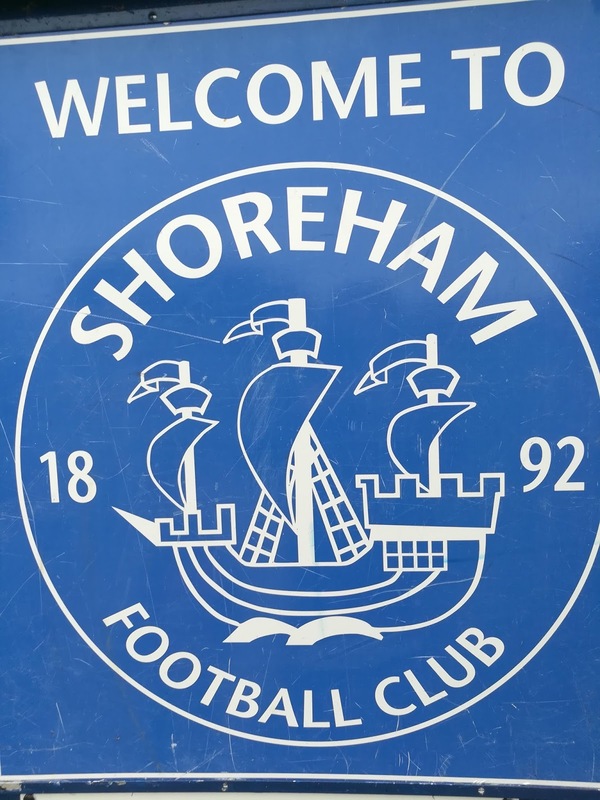 For their part, Shoreham seemed more than happy to go more direct, looking to exploit their star player, Andrew Dalhouse’s physical assets and the pace of Mike McCormick. It was a tactic that ultimately served them well. Their only real moment of quality in the first half saw the aforementioned Dalouse shimmy past a couple of half-hearted tackles and then fire a shot from 20 yards, which gave the home custodian no chance. The goal ensured the Musselmen somehow went into the interval 1-0 in front. Eastbourne fans (of which there seemed to be a fair number) didn’t have too long to wait after the restart for an equaliser, with striker Evan Archibald equalising from the penalty spot (see video; unfortunately cut rather short as I was letting the kids be cameramen – phonemen? – for the day). From then on, the second half followed much of the same pattern as the first, with Eastbourne attacking for the main part, and Shoreham grittily, and occasionally robustly, holding on. But as the old cliché goes, you have to take your chances when you’re on top. This mantra came back to haunt Town just a few minutes from full-time, when a hopeful lofted ball into the visiting area was missed by the ‘keeper, and seemed to bounce off the side of Kai Bichard’s head before rolling into the unguarded net. Still, Eastbourne fashioned a chance to equalise, but in a moment which pretty much summed up their afternoon. a goal-bound shot was stopped on the line by one of their own players. As I left the ground, I heard a couple of Eastbourne fans bemoaning their luck and stating how much better they had been then Shoreham. He’s learning, the boy. He’s learning.